Janne Reddell and her late husband, Morro Bay real estate agent Dan Reddell, had planned to build their dream home on Cerrito Peak. But, environmental groups battled to stop the proposed development, and a lawsuit ultimately derailed the project. 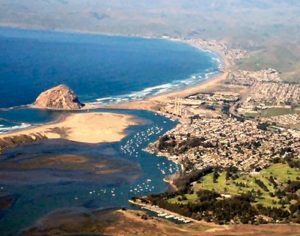 On Tuesday, the Morro Bay City Council voted unanimously to take $350,000 from the city’s emergency fund in order to purchase the Cerrito Peak property. City officials have said they plan to sell the property to a nonprofit conservation group. Reddell said she owes the city $85,000 and owes another $100,000 to an individual who holds a note on the property. Reddell said she will walk away with just $150,000 for a property that is worth much more than the asking price. Reddell now says she wants the property to remain open space, and she knows the city will take care of it. Cerrito Peak is home to a variety of wildlife, including Monarch butterflies, and Native American history. Morro Bay Finance Director Craig Schmollinger said the city has more than $3.9 million in reserves, so it will remain above the required level of $3.27 million level in its reserve fund. Many of us were “here” for the flippos underhanded fraud. Many of us were also friends of the family who owned the rollerskating rink and know firsthand of the deception when the city Bought the property knowing they would never continue operations.They screwed the Community children and families. Total BS on the part of the mayor & council at the time. Please enlighten us on what the building is used for now because every time you look inside it’s just stuffed full of junk. How long did the old Tigers folly paddle wheel sit in front of the property? As far as the Reddells, they were part of the good old boys circuit, lots of backdoor wink wink deals that forwarded many of their own interests. History doesn’t lie so don’t try to rewrite it. I am positive the city of Morro Bay will do an excellent job with the property. The last time the city of Morro Bay bought property to “save it” was the Flippo’s debacle when they intentionally deceived the family they bought it from and screwed the entire Town out of one of the best things the city had going. Former Mayor Yates and council lied and flipped the property selling it to one of the mayors friends who now just uses it as a junk storage unit. Mayors and councils have come and gone since then but it was a real eye-opener to never trust government, ever. I must say I’m glad to hear that the Reddells we’re not allowed to build (yet another) dream home as they did when Dans brother and then Mayor Dale Reddell somehow got special permission to build on a Pristine undeveloped hill during a building moratorium…. As someone who was here when that was going on, you have no idea what you are talking about. Bill Yates was the biggest supporter that Flippo’s had. It is not, now, used as a junk storage unit. Dan and Dale Reddell have done more good for the City of Morro Bay than you will ever do in your entire life. Well Dan, you fought the good fight but as with life we eventually all lose.I regret you never realized YOUR dream, but through the years you provided many with their dreams. Lets hope this site is not allowed to become a homeless encampment. That property is worth twice that. But if everyone is happy let it be. It’s actually a good thing the property will remain open space but I bet Dan is rolling in his grave.